Jack Berry kicked off celebrations for his 80th birthday 24 hours early with a party at the Injured Jockeys Fund centre which bears his name on Friday. The former trainer and indefatigable fundraiser has dedicated much of his life since retiring in 2000 to supporting the fund and received a special recognition award at the Lesters last December for his charity work. Berry is profiled by Steve Dennis as the subject of the Big Read in RP Sunday this week. Berry told Dennis: "I'm so proud of Jack Berry House, I think it's the best thing I've ever done. You couldn't get a bigger honour, could you, than a place named after you? I was very proud to receive an MBE, but to go there and see that statue of me, that was something else. "A few years ago I said I wanted to get Jack Berry House built before they carry me off in that box. So with that up and running, every day from now on is a bonus." 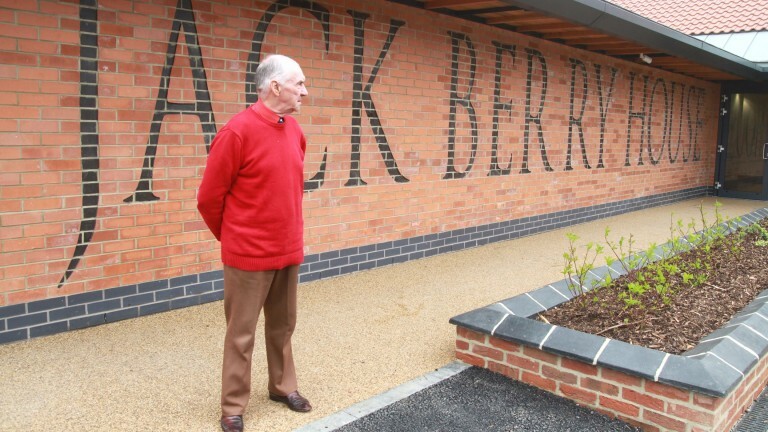 Berry became famous during his training career for his red shirts and for his way with two-year-olds and sprinters, four of whom – Paris House, Mind Games, So Careful and O I Oyston – are commemorated in the naming of rooms at Jack Berry House. The three-year bans imposed on Northern Ireland trainer Stephen McConville and his son Michael, an amateur rider, by the BHA last month arising from the Anseanachai Cliste incident at the Cheltenham Festival in March have been reciprocated by the Turf Club. The referrals committee of the Turf Club has decided that the bans, which began on September 19, will also apply in Ireland. The McConvilles were found guilty of administering by injection Hemo 15, a compound which contains the banned sunstance cobalt and also adrenalne to Anseanachai Cliste before the horse was due to run in the Foxhunter Chase at Cheltenham on March 17. Anseanachai Cliste was withdrawn from the race by order of the stewards. Tim Vaughan is hoping that Alan Johns could be back in action in as little as a week after the jockey suffered deep cuts to his right leg in a fall from Winido at Huntingdon on Thursday. "He had ten stitches in a cut below his right knee and there is a bit of a laceration there but he'll be back in around seven days with a bit of luck," said Vaughan. "He is fine and happy but it's in a slightly awkward spot down the front of his shin. If you imagine a jockey sitting up in his irons it is where the pressure goes on." Vaughan tweeted a picture of the patient sitting up in his hospital bed on Thursday evening but Johns was later discharged without the need for an overnight stay. The Racing Post's former racing writer of the year, Lee Mottershead, will appear on Sunday's Luck on Sunday, the new Sunday breakfast programme on Racing UK hosted by Nick Luck. The new show has received glowing reviews in its first two weeks, with guests including Nick Rust and Ralph Beckett offering candid views under the auspices of Luck, one of racing's most celebrated broadcasters. The show will air at 8.30am on Racing UK and run until 11am. It is free to view and includes racing from Hong Kong. Following a weekend without winners, it's another rollover Saturday on the Scoop6. Contests at Ascot, Newmarket and Redcar must be solved, and for anyone who does there is already £38,496 in the win fund and £281,216 in the bonus pot. You couldn't get a bigger honour, could you, than a place named after you?